As summer winds down and new schedules start we are left with the memories of summer fun! Sunshine ,vacations, outdoor adventures, graduation parties, and so much more! I hope that your summer was enjoyable and you got to do the things you wanted to do that make you happy and whole. For the month of August the challenge was all about goal setting and trying something new for 30 days. How did you do? Please! Please! Share what you did and if you are still doing it! Keep up the good work! Establishing new healthy habits is very much about behavior change and also realizing why you want to elicit a behavior change. Do you want to change your behavior because you want to be a good example for your kids and family or do you want to change your behavior because you have a high school reunion coming up and you want to lose 20lbs? I guarantee one of these is going to have a much better chance of being more consistent over the long haul and that’s what it’s about is the long haul. It takes a heck of a lot more than one day to get to where you want to be, sorry to break the news! 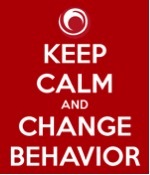 Create goals, change your behavior, figure out why you want to change or you WILL NOT adhere to it. For the month of August for 30 days I tried something new! I decided to set a goal to cycle at least 50 miles per week. I broke it up into 20 mile rides 3 days a week. Why did I do this? I love being in nature in the summer and cycling allows me to do that while also training my heart (the most important muscle)! I wanted to do something that would be complimentary to my muscle building leg work out days and I have found that cycling really helps, and it has helped in my lifting, especially back squatting. I live close to a few major recreation areas so why not take advantage of them! I wanted to switch up my workouts so I do not get bored. Here is a nice Fall inspired recipe that is great for breakfast, lunch or snack! 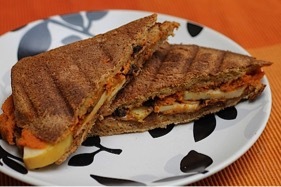 Grilled peanut butter, pumpkin and banana sandwich! YUM! Grill on a George Foreman, Panini Press or in a pan. Previous Foodie Friday: Is Yogurt Really Healthy? Next All Things Fall: October News!